Best Electric Power Bicycles for a Lazy, Fun Ride around Town! Power bicycles or electric bicycles are ‘regular looking’ bicycles with assisted electric power. They are a great way to save money on gas or even eliminate your need for a car altogether! Power bikes can usually travel up to 20 miles on one charge (some will even go further!) and the max. speed is usually around 15 mph. They do not require any other kind of maintenance other than fill up the tires with more air from time to time. The batteries usually last for more than one year! 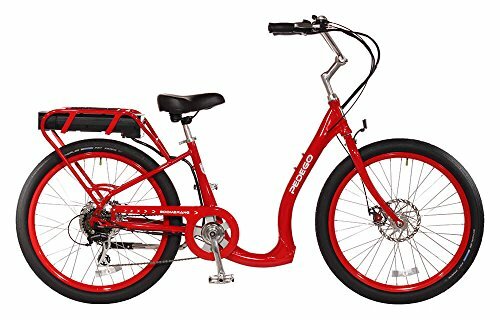 *This Pedego Boomerang step-through design battery powered bicycle in the picture above is an awesome power bike for women! It comes with a 500 watt motor that can go as fast as 20 mph! On this page I selected the best electric power bikes I could find, including the one I have been riding for over 7 years! I hope you will enjoy my selections! 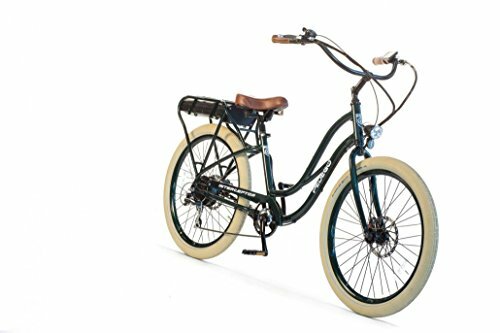 This Pedego Step-Thru Comfort Cruiser hunter green color electric power bike is one of the cutest looking electric bicycle models for women in my opinion! It goes up to 20 mph. It uses a 48V/ 10Ah battery and it offers you options of either simple throttle or pedal assist power. Overall this is one of the best and most modern electric power bikes out there! *To check price or buy one for yourself or someone you love just click on the image. This is another great electric bicycle model! 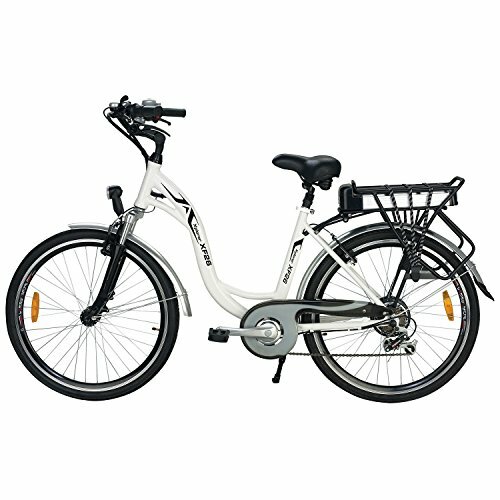 It’s a powerful 7-speed Shimano shifter electric bike for sale in a beautiful black and white color! Beautiful and practical step-through design and look! The top speed is 15 mph, which is pretty awesome! The range is up to 30 miles. One of the best features of electric power bicycles is being able to go up a hill with minimal or no effort at all! This gorgeous electric bike comes with a 36 volt in-frame advanced lithium ion battery pack which provides plenty of power. You can also combine both human power and motor power if you want or simply ride it as a motorcycle! It has five power modes, to vary the power boost! 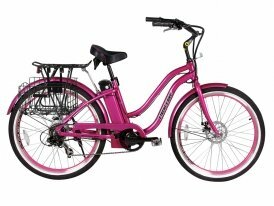 Beautiful Metallic Pink Fast Electric Bike for Women! This one is very similar to the one I have! I think it is one of the most beautiful and fastest electric power bikes being sold and it’s absolutely great! The max speed is around 20 mph. It has a 750-watt motor and 8 speeds! I am very lazy and just want to enjoy the ride! Great way to save thousands of dollars a year in gas and car insurance because of my cute and fun electric bicycle! I mostly use my electric bike to go grocery shopping, visit friends, go to the beach and run errands. But even if you cannot stop driving every day, you can still save money on gas by using your power bike to go around the neighborhood! 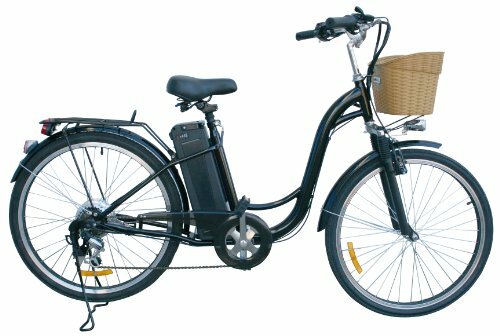 If you are looking for a fun, efficient but also affordable 26″ electric bicycle for sale today this is one of the cheapest ones I could find! It has a beautiful step-through design, a nice black color, and an 6-speed Shimano gear system as well! The cute basket is perfect for carrying all your stuff or buying a few groceries. Definitely a great and fun electric bicycle to ride! 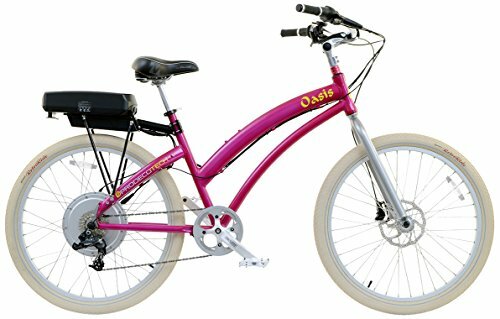 Beautiful Aluminum Frame Beach Cruiser Electric Bicycle PINK! This is a very beautiful hot pink electric bicycle for women! I love the color and the easy to use step-through frame! The front basket is also a great plus! It is also very smooth and very easy to ride, with a max. speed of 15 to 20 mph. It has a 300W motor and the charging time is about 4 hours.